Daniel Nsibambi, Uganda's Federation President has much to be proud of. Chess in Uganda continues to grow due in part to his efforts and a flourishing chess league. One example of the young talent nurtured in Uganda is Stephenn Kawuma, a mechanical engineering student at Makerere University. Kawuma will provide support to Ugandan veterans Grace Nsubuga and Shadrack Kantinti. Ugandan chess has been thriving as evident by its regional success in tournament play and its national activities. Nsibambi ensures that Ugandan players are able to compete not only nationally, but internationally. 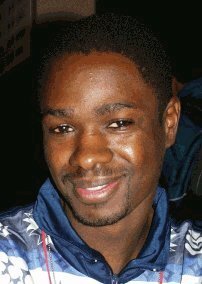 Nsubuga traveled to the US in 2001 to compete in the World Open and Wilbert Paige tournaments and his experience may prove valuable on board #1. 2002 Men's Team: (front row, from left to right) Daniel Nsimbambi (Captain) and Grace Nsubuga (Bd. 1); standing are (left to right) Shadrack Kantinti (Bd. 2), Ignatius Wanderama (Bd. 4), Isaak Munanira (Bd. 5) and Emmanuel Mwaka (Bd. 6), Steven Male Kawuma (Bd. 3). Photo by Jerry Bibuld.